Connect Storage Systems Ltd - Shelving Systems, Pallet Racking & Mezzanine Floors in Dorset & Hampshire"
Connect Storage Systems offers over 50 years materials and handling experience combined with the latest design technology, thus enabling our product range to be tailored to suit the specific needs of the customer. We specialise in the design, supply and installation of high quality effective storage solutions to meet the needs of your business. 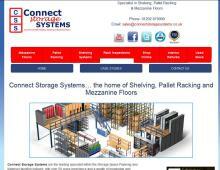 We advise on an extensive range of storage systems helping to increase your storage efficiency. Connect Storage Systems can also supply good quality Used Pallet Racking & Shelving systems from stock held at their base in Poole, Dorset.